Personalised computational models of how our bodies work have the potential to become a powerful tool for understanding, and eventually treating, complex illnesses like cancer. Because each person is biologically unique, computational models personalised using biological data extracted from individuals can help us understand why some people respond to medical treatments in unexpected ways. Computational modelling uses mathematics, physics and computer science to represent and simulate the behaviour of complex systems, such as cells. Computational models are in silico representations of the systems being modelled. We can build models by taking existing knowledge about the biological system in question and representing different parts of the system using variables which can be adjusted. Researchers can use these models to make predictions about what will happen in the real system. They can also test different conditions by changing the values of different variables. To understand how computational models work, imagine you are trying to bake a cake that has ten ingredients. If you want to know what the role of each ingredient is, you could bake ten cakes, each time leaving out a different ingredient. This would be an extremely time-consuming approach, as any pastry chef will tell you. Alternatively, if you could explain to a computer what each ingredient does and how it interacts with others. This would allow you to run any number of simulations to find out how removing ingredients or changing the proportions will affect the cake. And you could do all this in a matter of seconds, with minimal resources, materials and inedible cake leftover. Similarly, in biology, computational models significantly speed up research because they allow scientists to conduct thousands of simulated experiments using computers. The results are a good indication of what physical experiments are most likely to work in the real world. 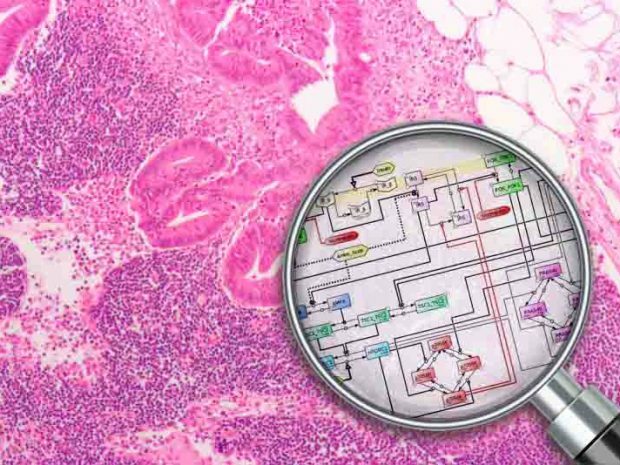 Cancer is one group of diseases that scientists are exploring using computational models. A study published in the journal Science employed computational analysis to investigate dissimilarities between different cancer cells and amongst cancer patients. The 6,753 models used in the analysis were derived from tissue samples collected from cancer patients. They span 17 major human cancer groups (21 different types of cancer). All these models are now freely available through EMBL-EBI’s BioModels Database, on the Patient-derived genome-scale metabolic models page. Researchers studying cancer can use these models as a starting point towards exploring what happens in tumours at molecular level. Scientists can use the models in the development of better cancer treatments with fewer side effects. In the future, such efforts could result in personalised treatments tailored to unique needs of individual patients. “Each model is associated with a single patient,” explains Varun Kothamachu, Postdoctoral Computational Biologist at the Babraham Institute and a Visiting Researcher at EMBL-EBI. “It contains information about the metabolism of the tumour sample, as well as metadata about the age and gender of the patient, plus the clinical outcome. The KTH-Royal Institute of Technology in Stockholm approached EMBL-EBI’s BioModels team to curate and disseminate these models. “By standardising the models and their metadata, we are creating tools that other researchers can use in their experiments. Hopefully this will speed up the rate of discovery even more,” points out Rahuman Sheriff, BioModels Project Lead at EMBL-EBI. Anybody can submit a model to the BioModels. If you have computational models representing biological systems that you would like to share with the wider community, please send them to BioModels here. For models with large datasets or any specific enquiries, please contact the BioModels team. BioModels is a repository of computational models of biological processes. It hosts manually-curated models described in peer-reviewed literature and models generated automatically from pathway resources (Path2Models). All models are provided in the public domain and enriched with cross-references from external data sources. To find out more, go to the BioModels website or check out the latest Model of the Month.